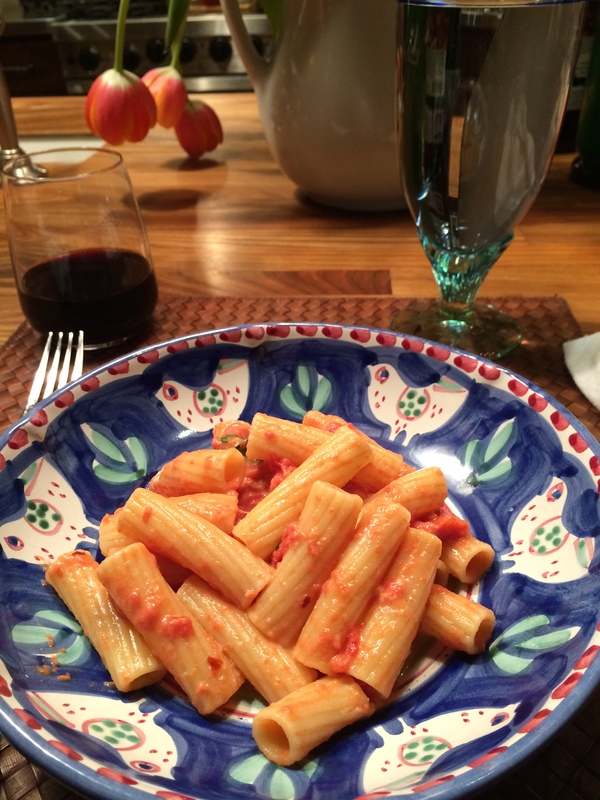 Pasta is probably my favorite go to meal, and I mean Vodka? really? Add a little cream and a can of tomatoes and you’ve got a spectacular meal. 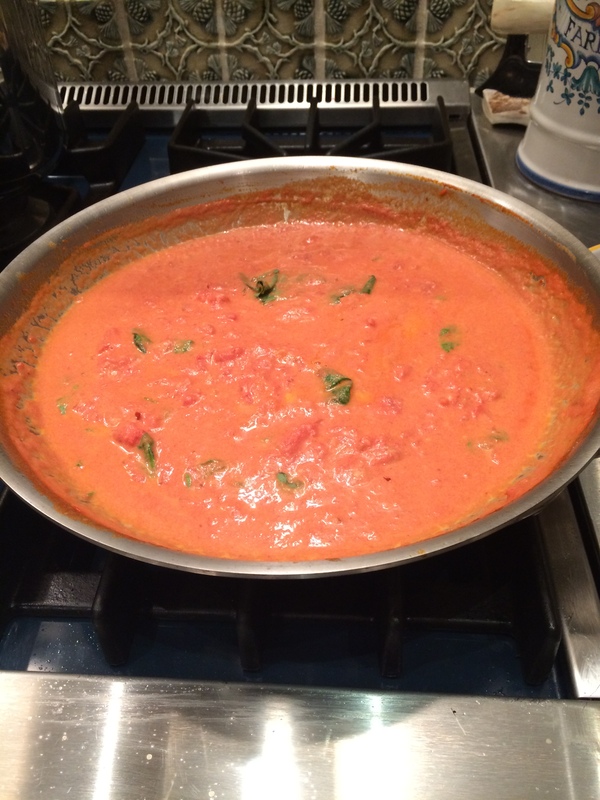 You’ll also need a little fresh basil and parmesan to finish it off. 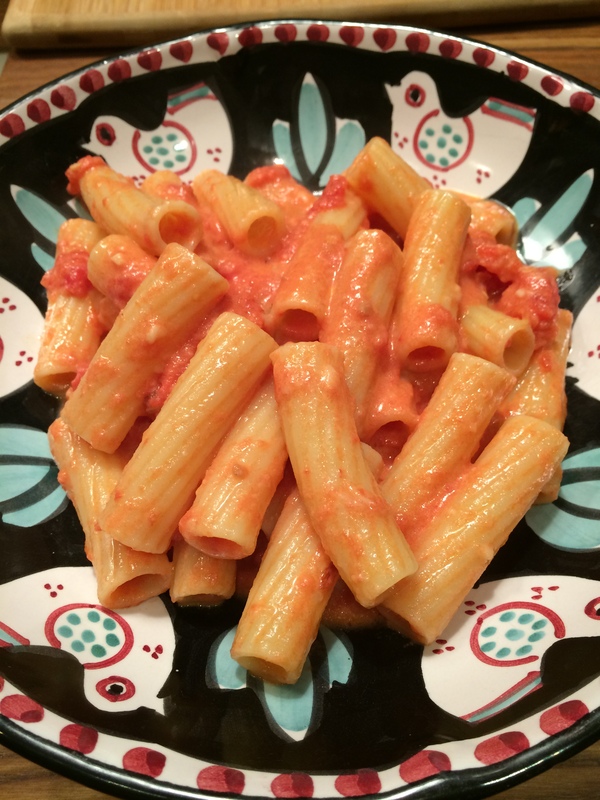 It’s an easy meal and if you have the cream and cheese in the house you’re good to go. I always stock the tomatoes and I happened to have the cream in the house and there is always a bottle of Vodka in the freezer right? Fresh Basil is a wonderful layer but if you don’t have it you’ll still be fine. 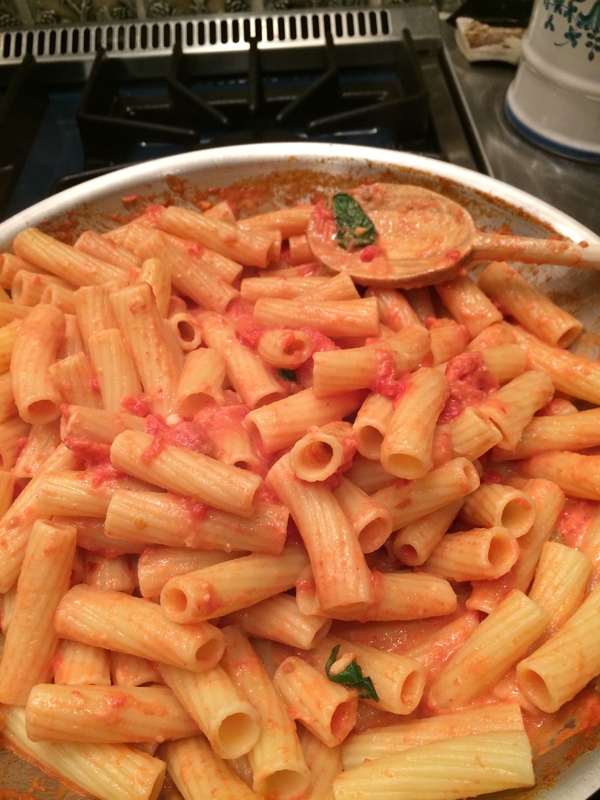 This pasta cooked up in no time and it was heavenly. Perfect for Meatless Monday dinner. Prepare pasta according to directions on box, I always throw in about 2 teaspoons of salt to it. When pasta is ready , just drain. I made the sauce while the pasta was cooking. Place a large skillet type pan on the stove (see pics) Add the olive oil and heat until it shimmers ( app. 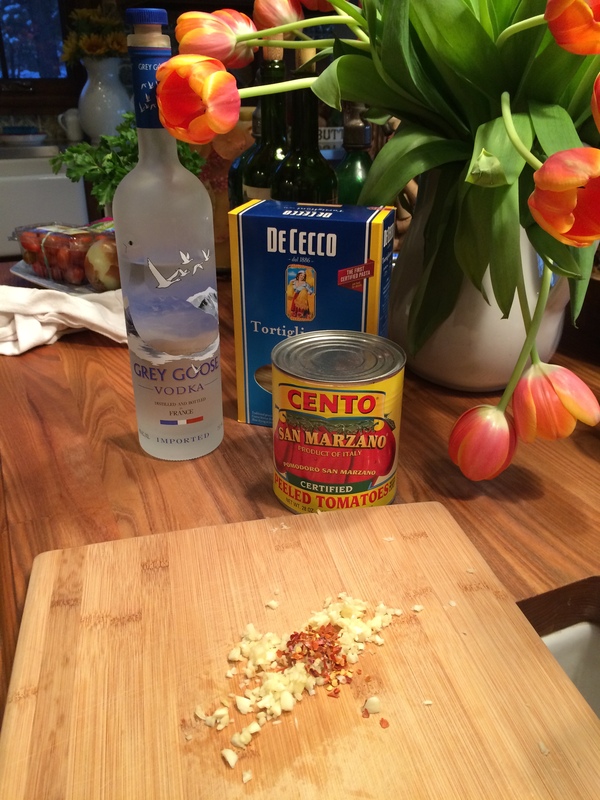 1 minute) add the garlic and red pepper (if you’re using it). Cook garlic and red pepper and cook, stirring until soft and fragrant but not browned, this should be less than a minute. Add the vodka and cook down the vodka until it is nearly evaporated. Add the tomatoes and remaining 3/4 teaspoon of kosher salt (start here and add to your own taste) bring to a boil (breaking up the tomatoes with a wooden spoon as they cook down) A little trick I use is to use a potato masher and push down on the tomatoes while they’re cooking, just be careful and do it slowly because you wouldn’t want to get burned by some hot tomato sauce. Lower heat to medium-low and simmer for 30 minutes. Add the cream , basil and grated Parmesan and bring to a boil , then reduce and let flavors marinate for about another 1/2 hour on a very low heat. I continue breaking up the tomato bits. Add the cooked pasta to pot and stir to coat the pasta!!!! Serve it up!!!!! A-mazing meat-less meal. 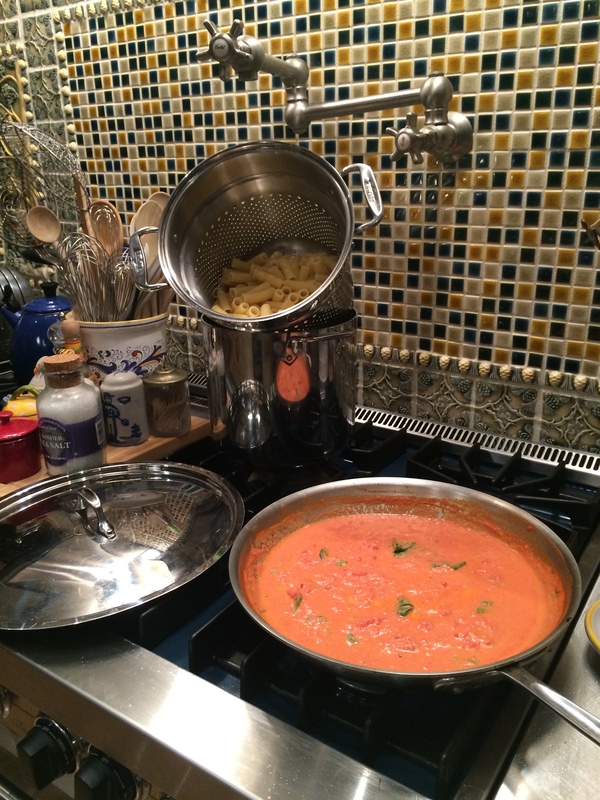 This entry was posted in Uncategorized and tagged Comfort Food, Pasta, pasta with vodka sauce, vodka sauce. Bookmark the permalink.